A much-changed Northants Centurions team suffered a double dose of defeat in their latest clash against Long Eaton Storm - but there were plenty of encouraging signs. 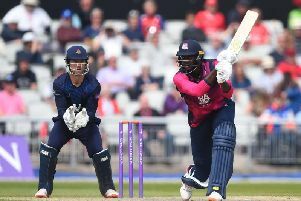 The Northants squad made the trip up the M1 to Long Eaton to face an in-form Storm side who’d won every game since losing a double header at Birmingham on the opening day of the season. Foo Fighters gigs at the London Stadium, and the small matter of an England World Cup match meant there were a few key players unavailable, but this meant opportunities for a number of younger players. Game one saw Marc Tobin take the mound for Eaton. He’s one of the faster and more accurate pitchers at this level, and he was at it from the first pitch, giving the Northants hitters very little opportunity to get anything going. Matt Ingram took the mound for Northants, and while he pitched accurately and with control, the Eaton hitters were on fire. Northants failed to score in the first innings, and with Eaton scoring the maximum five, it was going to be tough going. Northants responded by getting a couple of runs home in the second, to pull back to 5-2, but once the Storm put another five runs up at the bottom of the second, there was only one likely outcome. With this in mind, Storm made a smart move in taking Tobin out of the game to save a few innings for game two. The Eaton bats continued to fire, but Northants came to life, with a couple of strong innings toward the end. Ross Barnes came in to finish off the pitching for Northants, and the scoreline finished 18-9 in favour of Storm. Making an impression on his Northants debut was new signing Arek Szyszka, who got on base three times in four plate appearances and showed some great baserunning instincts. Game two followed a similar pattern, with Tobin able to pitch two strong innings at the start for Long Eaton. Northants’ pitching started with Barnes and was finished by Ingram. Pitching in between those two, Dom Rawlins, making his first Northants appearance since going to university, suffered a shoulder injury and had to come out of the game. While Eaton again got off to a fast start, the Northants bats again rallied towards the end, and the score finally finished Long Eaton 11-6 Northants. Huge credit to the younger players involved, third baseman Jacob Howard, twins Ben and Scott Russell, student Neal Sheth and returnee Rawlins, all of whom acquitted themselves admirably and will give the Northants squad impressive depth as the season passes the halfway point. The Centurions are at home to Cambridge on Sunday (July 1), and will be hoping to return to winning ways. First pitch will be midday at St Crispin’s in Duston, and supporters are welcome.